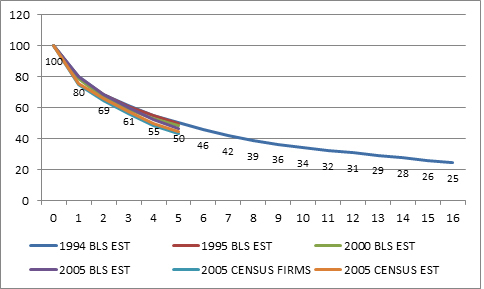 Source: Created from data from Longitudinal Business Database 1977-2010, Census; Business Employment Dynamics 1994-2010, Bureau of Labor Statistics (BLS). Some types of incubators help premature infants grow in a secure environment, and others help chicks hatch from the egg. Our secure and supportive environment is designed to help develop entrepreneurial ideas for companies that are just starting out until they find their niche in the market. An NBIA (National Business Incubation Association) study conducted among 1,900 incubated companies in 60 countries found that 87% survived their fifth year, far higher than the overall rate of 50%. Just as importantly, 84% of incubated companies stayed in the communities in which they first grew - providing an important engine for economic growth in cities and countries around the world. Incubated companies also become leaders in their field, creating many job opportunities and providing their founders with great personal growth. They have a filtering model that focuses on new companies and ideas. They offer an initial investment and a wide variety of business services that are available to entrepreneurs in the incubator's domain. They involve a finishing process that makes use of measurements and metrics, and the companies in these programs are expected to move onward and upward. As a rule, incubators prefer entrepreneurs that know how to accept assistance. In general, the services that incubators offer to start-ups include a wide variety of shared office services, such as communications and networking, furniture, and the use of other facilities. More important, however, are the business services, advice, training, and access to a network of entrepreneurs and other companies. Selarator provides space, a communications network, and a development environment as well as tools, furniture, financial services, legal services, and other infrastructure services. Our entrepreneurs also receive business support from mentors both inside and outside the incubator, as well as certification, advice, and continued training. Selarator is especially designed to meet the needs of entrepreneurs. We provide our clients with an exceptional environment of support and care in both technological and business matters. Selarator was established for entrepreneurs. We provide our clients with both the tools and guidance for success.